When I was a little girl my favorite time of year was springtime. Waking to the sound of lawnmowers roaring up and down the street and the ligustrum blooming outside my open window, I took the good with the bad. We didn’t know what allergies were in those days. A stuffy or runny nose in the spring was acceptable and a rite of passage from winter to spring. 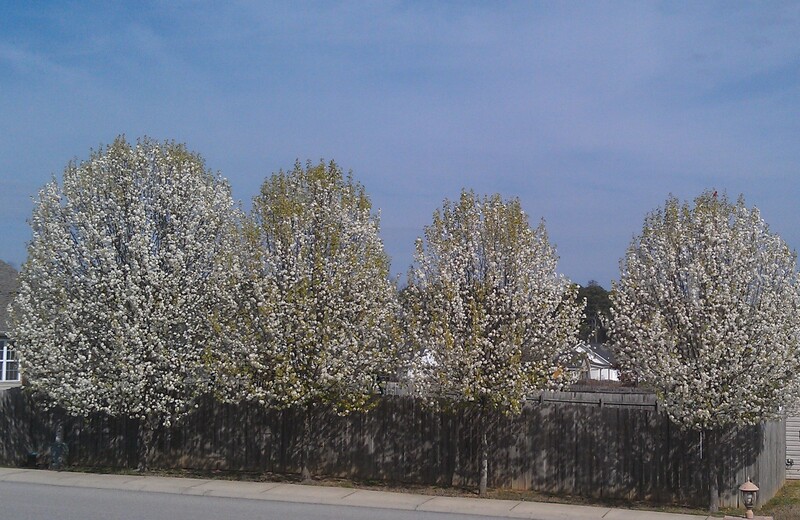 Today the Bradford Pear Trees are in full bloom; already their petals are flying across the airwaves from yard to yard. The other day my throat closed up on me in the middle of a conversation with my new neighbors. I walked down with a bag of chocolate chip muffins, just out of the oven. So warm, the plastic bag was steamed over. The teenage son, twin ten-year-old boys, and 8 year-old daughter gobbled them up while their parents and grandmother and I exchanged names and telephone numbers. I was there only a few minutes so as not to disturb their unpacking, but by the time I walked back to my house two doors down, I could not stop coughing or catch my breath. I thought at first I was choking and then it came to me that it was the blossoms of the pear trees across the street from my house. Once inside the house, I drank some water and washed my hands and face. This seemed to help. I felt refreshed and renewed, not unlike the feeling I get when winter turns into spring. But this year seems to be harder than years in the past. My first full spring in my house where half the garage still needs to be unpacked so that the storage unit that needs to be emptied can fit into the garage. I can’t seem to part with some of my family furniture like my parent’s antique Queen Anne dining room table and antique four-poster bed, or my grandfather’s antique sofa. I don’t have room for them in this house because I no longer have a den or a formal dining room. And it is not fair to ask my children to burden their homes with pieces of furniture they don’t want. So for the time-being they will be housed in the garage, along with my craft supplies, sewing materials, albums of the children when they were babies, and various other things that would not survive life in the attic over the garage. The other day while working on the garage, I found a picture of my mother and her mother standing opposite a table filled with an abundance of food. The table was covered in a cotton cloth and a vase of flowers. It was outside the screened porch under some pine trees at my grandparents’ home. It was Easter Sunday. My mother and grandmother look pretty and happy. In the same batch of pictures was one taken earlier in the winter, at Christmas. Again my mother and grandmother and most of the rest of the family are seated around the table, all turning toward the person, most likely my father, who is taking the picture. This time the table is in my grandparents’ dining room and again the table is beautifully set and filled with an assortment of food. But not one of us is smiling in the picture. It is clear that this is not a good day. Probably my mother has been drinking too much and her mother and father are upset with her. My father has gone into the protective mode hovering over my mother and being defensive to my grandparents’ remarks. My uncle is also drinking heavily and his wife is not supportive but instead mad at him. One spouse is enabling while the other is admonishing and we children are caught in the crossfire once again. As the oldest of the cousins, it was my duty to stay calm and stay the course, to pretend all is well. This was not a job I was given, but one I imposed upon myself. Welcome to the world of living with alcoholics. There I am in the picture, clearly a young teenager, maybe 12 years old, with my legs crossed like a young woman wearing fancy white boots, like the models of the early ‘60’s, and in my arms is a baby doll that I got for Christmas. How mixed up is that? It is no wonder that wintertime brings up feelings of inadequacy and hunger for a better life. And that springtime is just the opposite. We are all called to be the person God wants us to be. If we are to live as Spiritual beings so that God can live through us, then we must choose to be free of the things that hold us back. I can choose to live in the wintertime of negativity or in the springtime of renewal where I claim my freedom as a child God. So give me a runny or stuffy nose any day! I am free!